Master the basics of UI design with this bundle of courses. When you visit a website that's easy to use, the experience is more enjoyable for you as the user. That's what user interface (UI) design is all about – putting together a webpage's text, images, buttons, and tabs in such a way that it is intuitive to use and nice to look at. Want to get involved in UI design? 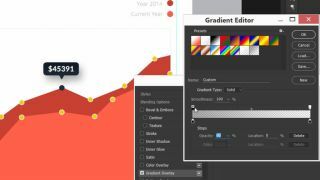 Check out UI Design With Photoshop: From Beginner To Expert. This course teaches you all about Photoshop and the role it plays in UI. Through 17 chapters and 11.5 hours of content that you can access 24/7, you'll learn basic shortcuts, settings, and tools that are very useful in the UI designer's toolkit. You'll also master light and shadow concepts, as well as pattern and gradient techniques. Best of all, you'll be learning from an award-winning designed, Muhammad Ahsan Pervaiz. Check out UI Design With Photoshop: From Beginner To Expert for just $9.99.